Following the success of their amazingly delicious “Pipe Sauce” e-liquid line, the guys at ePipeMods returned to their famous Laboratorium to work on a new collection of unique non-tobacco juices. Introducing the Steam Sauce e-liquid by ePipeMods. Considering the massive success of Pipe Sauce flavors like Long Bottom Leaf or Shire Malt, I admit I had some pretty high expectations from the new Steam Sauce collection. The first thing that I noticed was that while ePipeMods retained the 95%+ VG base, their new line included a higher number of flavors than the original. 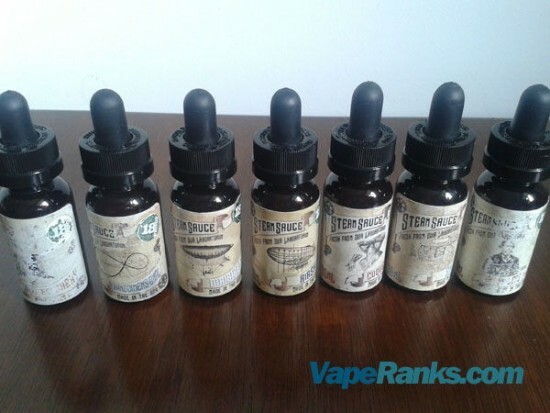 While Pipe Sauce includes seven flavors to choose, from, Steam Sauce features a total of 16. 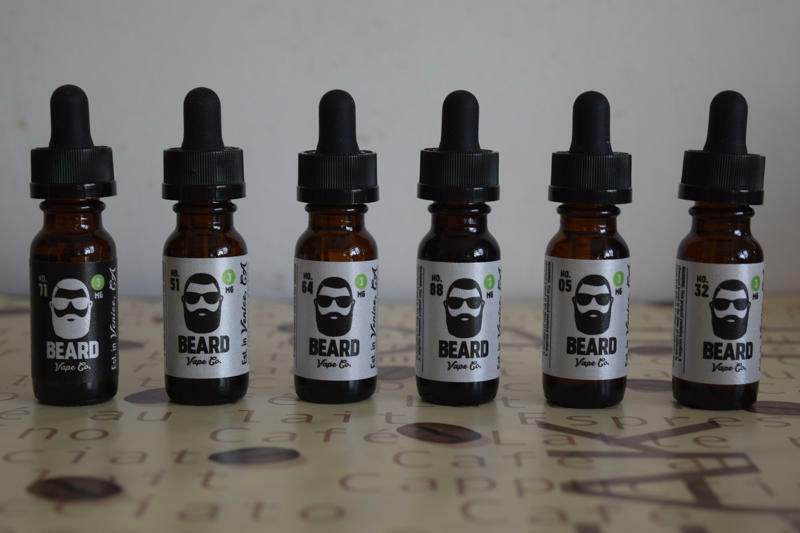 The wide variety of flavors is definitely a big improvement and one of the strong points of their new e-liquid line, which includes everything from fruit mixes, to chocolate and even absinthe. 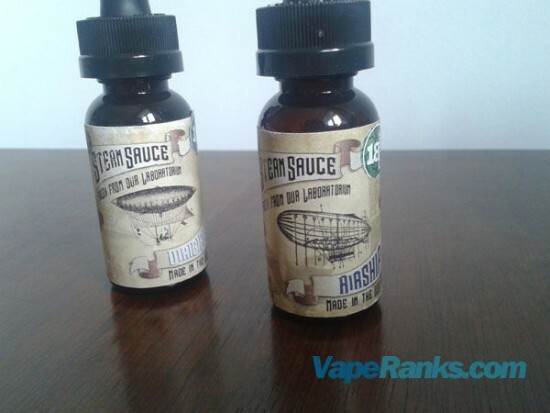 But what I found most intriguing about the aptly named Steam Sauce e-liquid were the names and labels of the flavors, both undoubtedly inspired by Steampunk culture and the Victorian Era. Dirigible, Clockwerk, Apothecary or Nautilus are just some of the quirky names chosen for Steam Sauce juices, all of which also features probably the most artistic labels I have ever seen on an e-liquid bottle. Zeppelins, submarines, crazy weapons and even the mighty Cthulhu adorn the e-liquid bottle, making them even more appealing. You can see ePipeMods invested a lot into the presentation of their new e-liquid line, and as a big Steampunk fan, I appreciate it. But ultimately, it comes down to the quality of the “sauce” so let’s see if ePipeMods delivered again with their new e-liquid. Airship – If you’re a fan of fruity combinations, the first mouthful of Airship vapor will take you up on cloud nine! It’s a refreshing mix of kiwi and strawberry with just a drop of menthol added for a cool aftertaste. I had never vaped kiwi before, but after taking a whiff of Airship I realized what I had been missing all this years and couldn’t wait to fill up my AeroTank with it. The sweet and sour combination is a winner in my book, and the hint of menthol, although undetectable by my sense of smell, makes for a cool aftertaste. This is a must-try for any fruity e-liquid fan. Coquette – Talk about a walk down memory lane! I must have eaten a ton of Coca Cola flavored gummy candy as a kid, and vaping Coquette took me back to those carefree days. Just like the candy, this juice has a very clear and strong Coca Cola taste, with an added spiciness. ePipeMods describe it as a “mix of rum and coke”, but I didn’t really feel the rum. It was more like a hint of cloves, not strong enough to mute the coke flavor, but definitely noticeable. A great vape, especially if you liked cola gummies as a child. Snozzle – Pear-flavored e-liquids are quite rare, which only made me appreciate Snozzle even more. Described as a “concoction of luscious pear and berries” by its makers, Snozzle is without a doubt one of the best fruit juices I have ever vaped. Although I could definitely taste something else besides pear, I could never really put my finger on what berries were used to make this stuff. Not that it matters too much anyway, as the strong taste of pear hints that it was meant to shine in this delicious fruit mix. And it most certainly does. Dirigible – I wasn’t familiar with Stewart’s Orange’n Cream soda, so the “sweeter than a cold Stewart’s orange soda on a hot day” description on the ePipeMode website didn’t really mean anything to me. I just ordered it because I was curious about how they had nailed the orange soda flavor. I don’t know if Stewart’s Orange’n Cream actually tastes creamy, but Dirigible certainly does not. The orange is pretty clear though, with an extra spiciness probably meant to emulate the fizziness of a soda. Transdimensional – With a name like this, I have to say I expected this grape-flavored e-liquid to be out of this world. Grape juice is one of my favorite soft drinks, but having tried over half a dozen other grape e-liquids before, I was never completely satisfied with the flavor. Some were too sweet, others were so strong that I felt like I was vaping perfume or simply had a nasty chemical aftertaste. The smell of Transdimensional was very promising, and after the first draw I knew I had found the grape vape I had been looking for. The best way to describe Transdimensional is grape juice in vapor form, it’s really that good! Phileas Fogg – Named after the main protagonist of Jules Verne’s literary masterpiece “Around the World in Eighty Days”, Phileas Fogg is supposed to taste like a “fresh, cool sangria”. I’m a big fan of the traditional Spanish drink, so this was one of the first Steam Sauce juices I ordered. Sadly, to me, Phileas Fogg tasted nothing like sangria. It contains the same grape flavoring as Transdimentional and a mix of other fruit flavors, while sangria is actually red wine and fruits. It’s got a strong fruity aroma to it, it’s less sweet than Transdimentional, but if you’re looking for a spot-on sangria flavor, this ain’t it. Haberdashery – This is hands-down the best chocolate-rum e-liquid I have ever vaped. Words really can’t express how delicious Haberdashery is, you really have to try it for yourself. I didn’t really feel the rum that’s supposed to be in Coquette, but they definitely got it right in this one. Haberdashery smells incredible and the vapor is even better – the chocolate feels so natural and the rum just complements its flavor so well it’s insane. You have to try this Steam Sauce, you’re going to love it, even if you’re not a huge chocoholic, like me. Usually I talk about the throat hit and vapor production of each individual e-liquid I review, but in this case, all Steam Sauces performed virtually the same. the shop I ordered from only carries 18mg/ml nicotine Steam Sauce, which made the throat hit a bit too strong for me – I usually stick to 12 mg – but I got used to it after a while. Vapor production was also very impressive, as is to be expected when vaping full VG-base e-liquids. Even though I have yet to try all the Steam Sauce flavors, so far it seems to be another big hit for ePipeMods. Why Does My E-Liquid Lose Its Flavor?